• 4DB strikers can scrape a ferrocerium rod causing showers of hot sparks easily. • 5 sharp 90 degree edges allow for a very efficient and effective multi-use tool for any outdoor enthusiast. 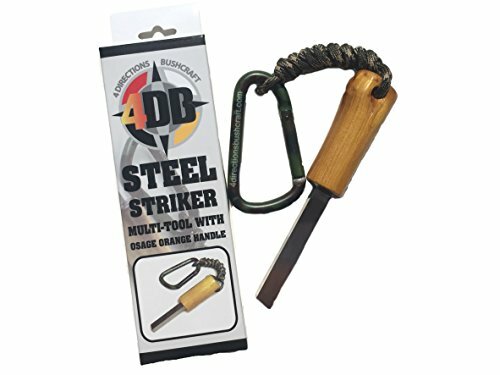 • The 4DB High Speed Steel Sriker can easily process tinder such as pine lighter fatwood and many others for fast and reliable fire starting. • Each striker has it's own unique look due to the handcrafted Osage Orange wood handles and measures total length of 5-5 1/2". •34″ snake braid deep woods fire tinder 550 paracord lanyard. This multipurpose paracord has an eighth inner strain of jute twine tinder that allows you to always have a tinder source with you that will easily catch a spark from a ferrocerium rod and start your fire. • 4 Directions Bushcraft camouflage carabiner makes it easy to clip to any bug out bag, survival bag, camping, hiking, fishing or hunting bag. • No longer have to use the back of your knife or any other tool. • Easy enough for kids and novice nature lovers to use effectively. 5 sharp 90 degree edges allow for a very efficient and effective multi-use tool for any outdoor enthusiast including kids and novice nature lovers. Process tinder such as pine lighter fatwood and many others for fast and reliable fire starting. 34" of 550 deep woods multi-use fire tinder paracord lanyard and 4 Directions Bushcraft camouflage carabiner makes it easy to clip to any bug out bag, survival bag, camping, hiking, fishing or hunting bag. Simply, effective and reliable. No longer have to use the back of your knife or any other tool to strike your ferrocerium rod firestarter. If you have any questions about this product by 4 Directions Bushcraft, contact us by completing and submitting the form below. If you are looking for a specif part number, please include it with your message.